Is the weekly ritual of clipping coupons from the Sunday paper becoming a thing of the past? I, for one, would not be sorry to see it go. These days all you need is a mobile device to find great deals. Here are 15 apps you’ll want to have the next time you go shopping. The original rebate app and the one I still use most often. Ibotta offers money back on a variety of products from an equally wide range of stores. Simply review the deals on your phone or computer and “earn” the rebate, typically by answering questions or watching a video. After you make your purchase, use the app to scan the bar code and snap a pic of your receipt, and Ibotta then processes your rebate. Or avoid all that and link up your loyalty card from one of Ibotta’s Preferred Partners; no further action is required after you make your purchase. Ibotta pays out once you hit $20 in earnings, either to PayPal or Venmo, or in the form of a gift card. Another rebate app like Ibotta with a couple of key differences. Ibotta deals have to be purchased at designated stores whereas many of the deals on Checkout51 can be purchased anywhere. Also, you don’t have to “earn” the rebate in any way – just click on the deal and then upload a copy of your receipt. When you reach $20 in savings, Checkout51 sends you a check. A rebate app that allows you to shop at any store you like. Scan the bar code and upload your receipt after purchase. The nice thing about Shopmium is that there’s no threshold for pay outs. The rebate automatically goes to your PayPal or bank account. 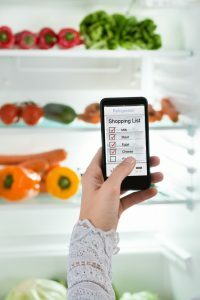 If you feel like you’ve been missing out on deals because you buy mostly organic foods, check out BerryCart, a rebate app that offers savings exclusively on organic products. BerryCart accepts receipts from any store and pays out after each purchase, either to your PayPal account or in gift card form. As with Ibotta, you do have to “earn” the deals by taking quizzes or reading some facts about the product. Like BerryCart, Shrink offers deals on products that appeal to health-conscious consumers. It’s a bit more complicated than other rebate apps, however. It connects consumers with brands, which run loyalty programs, each with different offers and rewards. You earn points for your purchases or for participating in activities, such as taking a poll. You can then redeem your points for more rebates, freebies, or cash. A rebate app that allows you to link your account with store loyalty cards.You search and select deals and then either use your loyalty card or upload your receipt. Your savings are posted to your SavingStar account. Once you reach $5 in savings, SavingStar pays out to your PayPal or bank account, or you can donate your earnings to a charity. If you like to know that you’re always getting the best deal, Favado is for you. Favado tells you the best prices on items at nearby stores so you know where to shop. It also shows relevant coupons, which you either print out or clip from another source. CouponSherpa is a large database of coupon codes (for online shopping) and printable coupons. The best part is that you don’t have to actually print the coupons. Most can be redeemed straight from the app. SnipSnap, on the other hand, turns printed coupons into mobile-ready offers. All you have to do is take a picture of the coupon. Or just search SnipSnap’s database of coupons. Note that SnipSnap only works on store, not manufacturer, coupons. Scout, offered by the same company that created SnipSnap, is a shopping assistant app. You submit a request on a particular item by taking a picture of the product. Scout then responds with competitor prices, coupons, price-match opportunities, and instant-mobile rebates. Shopkick works on a point system. You can earn points – called “kicks” – in three ways: 1) walk into a store; 2) scan products; 3) make purchases. You then redeem your kicks for a gift card. When you enter partner stores, CheckPoints will show you a collection of featured products. Scan items and you earn points, which you can then redeem for gift cards, gadgets, and other rewards. CheckPoints offers are tied to brands, not stores. If you are a Target shopper, you owe it to your wallet to be using Cartwheel. Cartwheel posts new offers every week, which you can add to your account and then redeem at checkout. Cartwheel offers can even be combined with coupons and rebates. My favorite Cartwheel feature is the scanner. You can scan a product in store and it will tell you if any Cartwheel offers apply. When you first start using Cartwheel, you are limited in the number of offers you can choose. However, the more offers you redeem, the more you can add to your account. I’ve used this app for years. CompareMe allows you to compare prices on two products, even across different units of measurements. For example, if one product is measured in liters and the other in ounces, CompareMe does the math for you and calculates which is the better price. Note that CompareMe costs $1.99. If you want a free app, try Apples2Oranges, which looks very similar. Slice applies only to online purchases, but I’m including it anyway because it looks cool! Slice is like your personal online shopping assistant. It organizes your receipts, tracks packages, and alerts you if any products you’ve bought have been recalled. Like Paribus (which we discussed here), it also checks for price drops after purchase and helps you request a price adjustment. 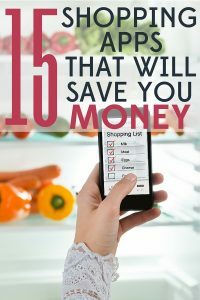 What shopping apps are you using? Highly Rated Bissell Big Green Professional Grade Carpet Cleaner $299.99 Shipped – Today Only! Wow, Mara! Amazing, interesting, and overwhelming. I am a fairly new smartphone owner. Currently, the phone is smarter than I. Are ALL these apps user-friendly? Yes, for the most part, I think they’re all pretty user-friendly. For the rebate apps (and Cartwheel), you can review and select the deals online and then you just use the app to upload your receipt. With Cartwheel, all you have to do is show your bar code at checkout, and you can actually just print that out. No phone needed. Some of them, like Checkpoints and ShopKicks, I don’t bother with because they’re too distracting while I’m trying to shop. However, I can see how someone who *likes* to shop would enjoy them. All in all, I think it’s definitely worth experimenting. I’ve saved hundreds using Cartwheel alone.